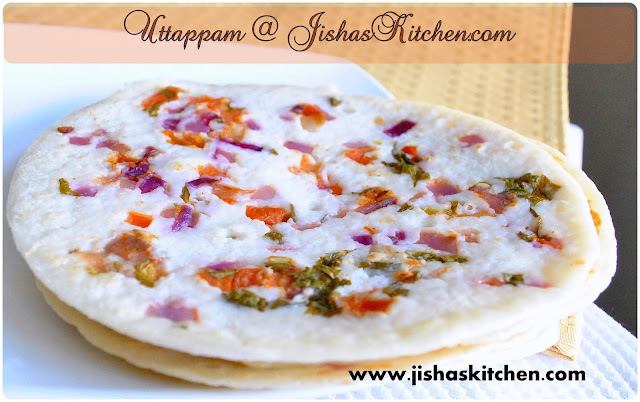 Uttappam / Uthappam is a delicious south-Indian dish which resembles Dosa. But we dont make it thin and crispy like our regular dosa but like a thick pancake. 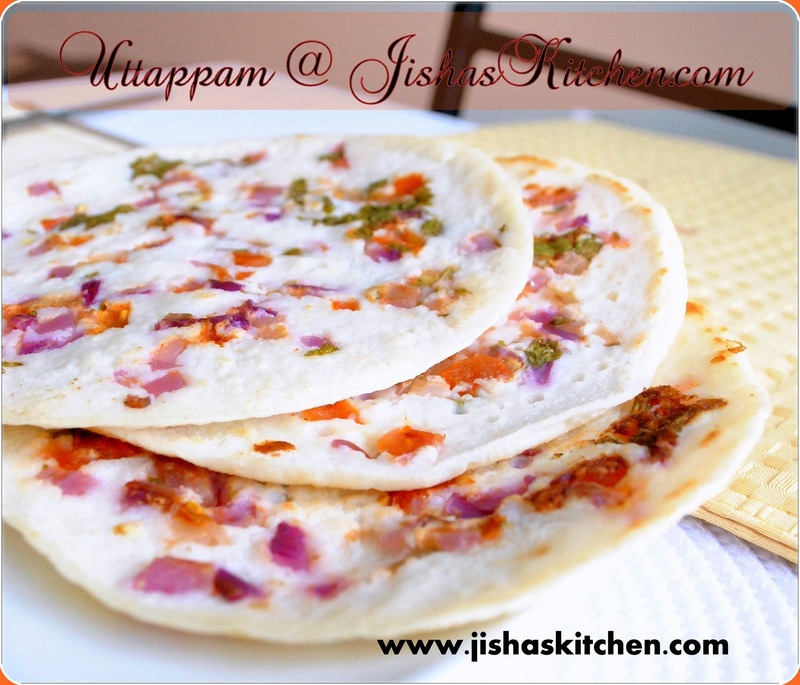 Its also known as Indian Pizza / Indian Pancake. First wash raw rice and urad dal and then soak raw rice and fenugreek seeds with enough water. Then soak urad dal in water in an another vessel. They both should be soaked in water for atleast 5-6 hours. Then grind raw rice, fenugreek seeds, boiled rice and urad dal to a smooth batter by adding water little by little.The batter should be of thick pouring consistency. Mix the batter nicely and keep it covered in warm place for atleast 10 hours for fermentation. Note: If you are grinding in the evening then you can keep it overnight for fermentation. After the batter is fermented and raised, mix it nicely and add enough salt. Then in a vessel mix chopped onions, chopped green chillies, chopped tomato , chopped coriander leaves, red chilly powder and little salt and keep it aside. Then heat a griddle / tawa in a medium low flame and grease it with little oil. Then pour a big ladle full of batter on the tawa and using the back side of the ladle spread it to a thick circle. Uthappams should be thicker than the normal dosa, so please make sure not to make it thin. Then immediately after that sprinkle the chopped vegetable mix on the top of the batter using your hand or spoon. Then cover it with a lid and cook for about 3-4 minutes in a medium low flame and then turn it around using a spatula and cook the other side for about 1-2 minutes. 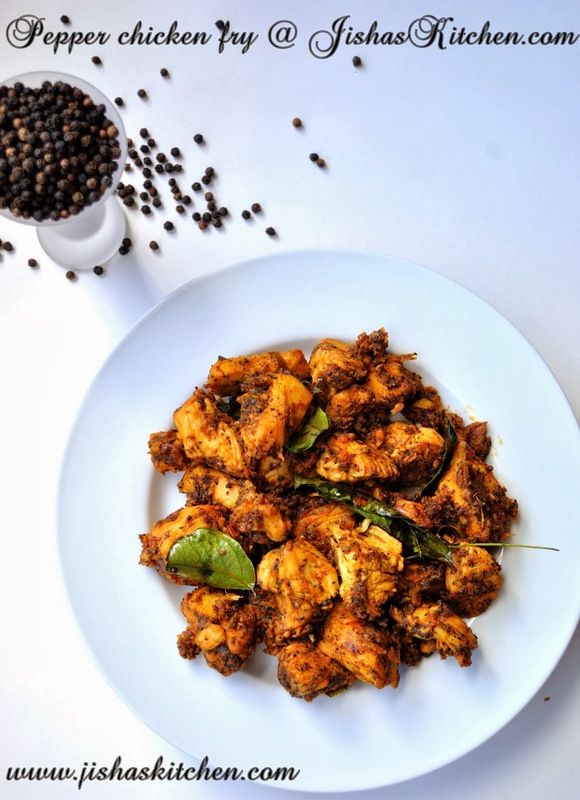 wow uthapam looks crispy n yummy....co incidentally ..we got same template design....frst time here...lovely space wth lovely pics..glad to follow u! Uthapam looks delicious with all colorful veggies. Delicious breakfast item. Yummy and colorful uthappam.. looks perfect !! Wishes for a very Happy and prosperous New Year. 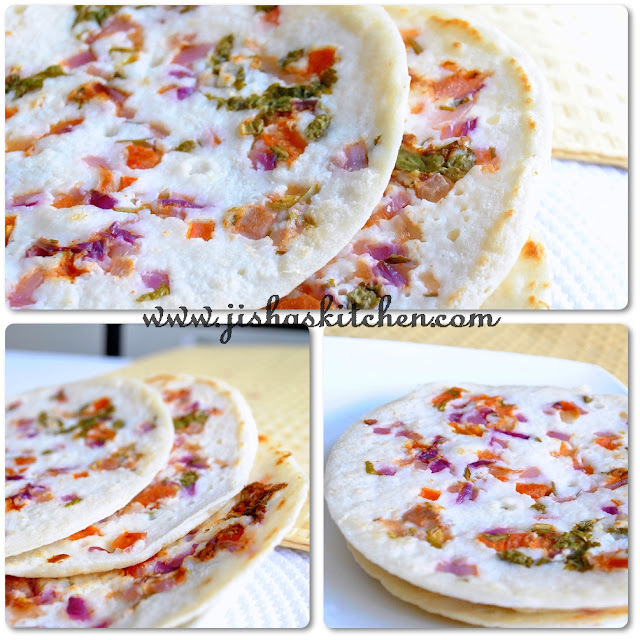 Yum, delicious and wonderful looking uthappams..
love utthapam with onion, tomato, coconut and chillies. 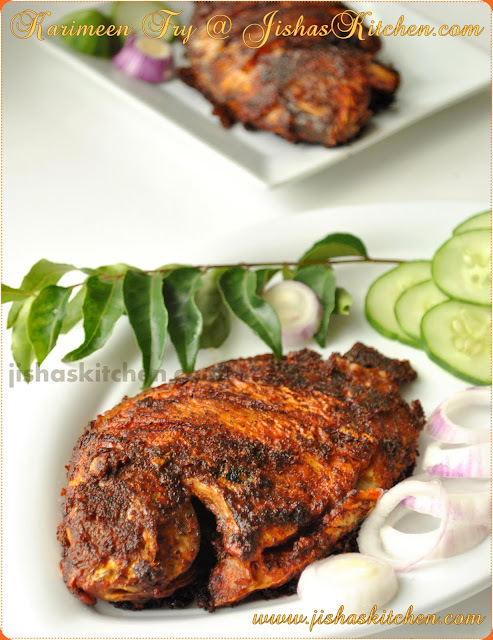 but here they only add onions and now will make this at home. thanks for sharing. Awesome uthappams..Loved your pics ketto..
Utappam is my all time favorite,you have made look so colorful and appealing to eyes!